Going off flowers for now. The Cathedral is still so busy. Since the reinterment visitors have been flooding through the doors of the Cathedral and the Visitors center. Yesterday 1967 people walked through the doors, and it's not just locals. I spoke to visitors from the USA, China, New Zealand and Wolver'ampton!!! 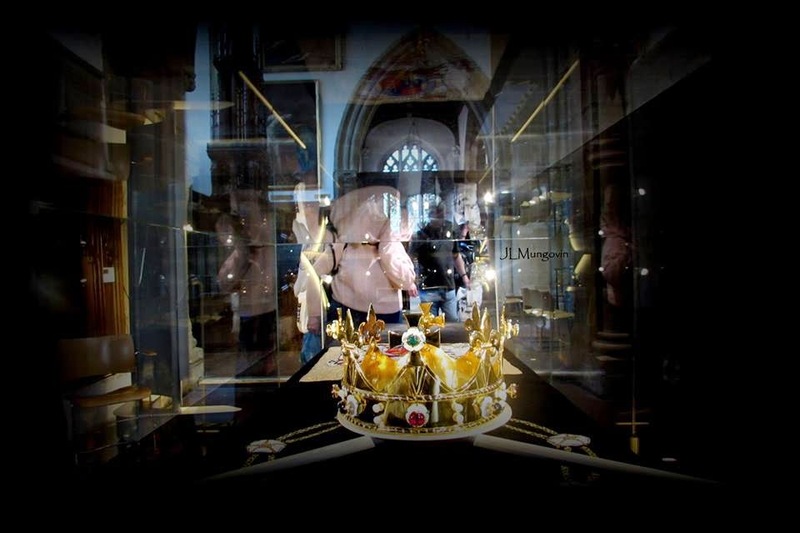 !visitors are not just interested in Richard III, people are asking questions about the history of Leicester. The couple from Wolver'ampton (can't imitate a West Midlands accent.... ) were staying in Melton Mowbray and we ended up talking about Stilton and Pork Pies. Told them about Anne of Cleaves House which is where they were going for dinner and the story of Ankle Hill!!!!.... named because a battle had been supposedly fought there and it was ankle deep in blood!!!!! The only thing that really got on my nerves yesterday were Kids and flashers!!!! !...yes flashers, ok not the perverted kind but those who use their camera and FLASH!!!!!.... there is a notice which asks people not to flash, but they don't take any notice. Not only does flashing give me migraines it will also ruin your picture, especially around the PALL, it will reflect. Why don't people take take any notice? It's also so difficult to police. One flash, then another and you have not idea who's flashing!!! I just stood there saying to whoever was listening "Please no flashing". And KIDS!!!.. ok some are little angels!!!... but what is it about trying to climb on the tomb? I know they want to look and feel and maybe they see the plinth as a step up to see the fossils, which they love, but the parents?? Why don't they stop them? Its so hard to catch the children. For one, you can't touch someones child, all I can do is ask "Please don't stand or lean over the tomb", hopefully loud enough so the little darlings can hear you and if you raise your voice one octave the parents glare at you!!! Adding a quick edit...... this makes it sound ALL the Kids are bad and run around!!!.... no they arn't. There are some very well behaved children and respectful parents. Just a small number. But the guides and volunteers are excellent and do the job fantastically. See you don't need to flash. But I am becoming an expert in fossils!!! The limestone was formed at the bottom of a shallow sea that covered much of what was to become the United Kingdom back in the early Carboniferous geological period. It is coarse grained and contains a substantial amount of fossil remains of invertebrate marine creatures, most notably the flexible stems of sea lilies otherwise known as crinoids. Crinoids belong to the same phylum as starfishes and sea urchins, they look superficially like plants (hence the name sea lily), but they are in fact an animal. Entirely marine, crinoids have been around since the Cambrian and can still be found today. The Stone was chosen because of it's beautifully polished finnish and the long dead creatures immortalised in stone. The Stone is also used in York Minster and Durham Cathedral. Just discovered your blog today & saw that you had me on your blog roll! Thank you & I've now listed yours on mine as well. Happy Blogging! I have only recently discovered your blog - and very interesting it is. Thank you for sharing. 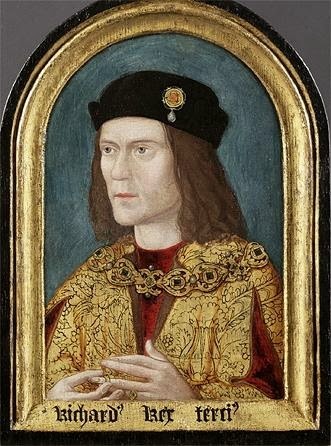 It is a shame that every mention of a child climbing on the plinth or trying to climb on the tomb is written up on the Anywhere but Leicester pages as proof that neither the people who visit nor the Cathedral authorities care enough about Richard to prevent such actions. It is very difficult to control, especially when the parents of the children concerned do nothing to control their offspring. Is there a polite notice in a prominent position to remind children and parents of where they are and to exercise some respect ?? It will be a shame if the tomb has to be dropped off. It is extremely difficult to police every visitor who comes to visit the tomb. Parents should ultimately take responsibility for their childrens actions and teach them the respect needed in a church. It's extremely exhausting for the guides and volunteers, you have to have eyes in the back of your head. Exhausting but very rewarding. 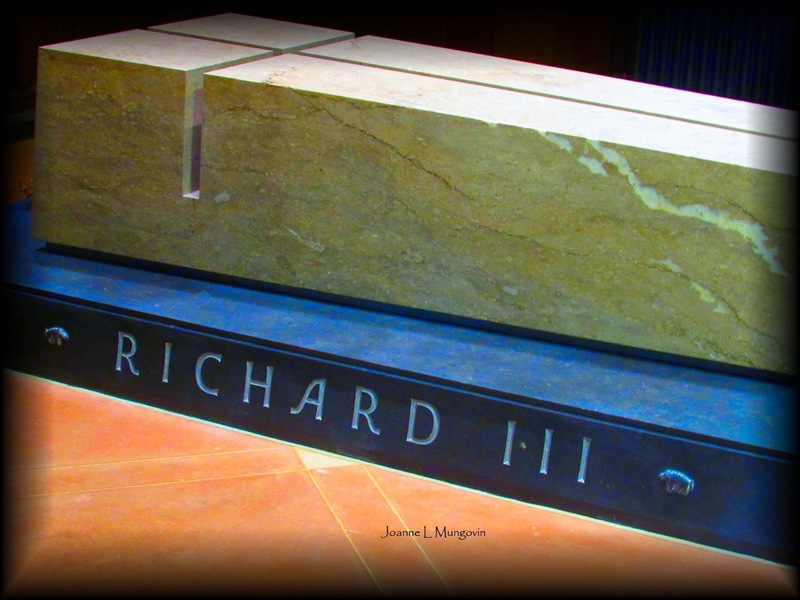 The Cathedral authorities care very much for Richard and the tomb and I would hate it roped off. I have to add there are very well behaved children and excellent parents. This Saturday I did her a mother telling her children how to behave in a house of God. I agree, I wouldn't want to see it roped off either. I think the Cathedral staff are doing a fabulous job. I'm enjoying reading these blogs. Many thanks!